Mariano was a "soldado de cuera" (leather jacket soldier). Mariano was eighteen at the time of his enlistment and was mostly likely schooled by his father, Miguel, he too a soldier for Spain. 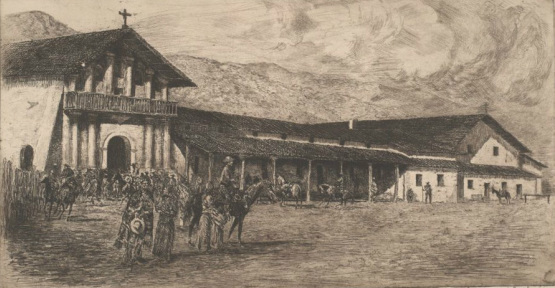 Miguel Cordero (first generation) had been a soldier for Spain since before 1733 and assigned to the Esquadra del Sur, with its headquarters at Todos Santos, on the southern west coast of Baja California. (2) Miguel married Angela Nunez before 1733. (3) Mariano was born in San Jose del Cabo, Baja California around the year 1750. (4) Mariano had two brothers, Francisco and Joaquin Ignacio, also soldados de cuera. Prior to the Gaspar de Portola Expedition of 1769, Miguel Cordero was an integral part of the expulsion of Jesuits in Baja California. Although the expulsion was most likely predestined, Miguel because of his years of service was one of five soldiers who gave declarations to Captain Rivera y Moncada and Lt. Fernandez de Somera on September 16, 1766, regarding the behavior of the Jesuits. (5) Miguel gave his age as 60 and was called literate (6); and his responses to the interrogation were hardly an indictment of any wrong doing by the Jesuits. 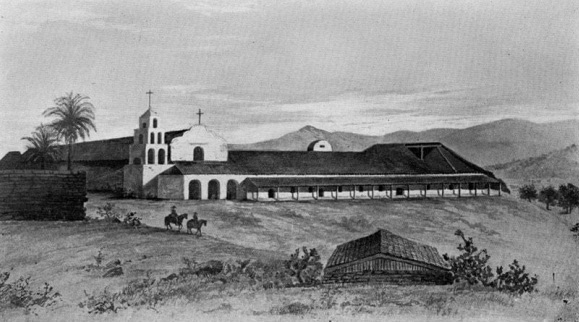 In the year 1775, Mariano was transferred to the Presidio of San Carlos Borromeo de Monterey. It was while at the Presidio de Monterey that Mariano met his future wife, Juana Francisca Pinto, daughter of Corporal Pablo Pinto. It was the year 1776 and the Anza Expedition had arrived, March 10th, from the Royal Presidio of San Ignacio de Tubac (present-day southern Arizona) at the Presidio de Monterey on their way to colonize San Francisco. Mariano (age 26) and Juana (age 13) exchanged wedding banns on November 28, 1776. January 07, 1777. Theirs was the first marriage listed in the book of marriages at Mission Dolores, San Francisco (Libro de Casamientos de San Francisco). Mariano and Juana enjoyed a healthy marriage, having eight children in the span of twenty-eight years. (10) On October 4, 1781, Jose Moraga at San Francisco listed Mariano as Cabo (Corporal) in a report. (11) In 1787, Mariano was listed as Corporal at Presidio de San Francisco. (12) Click here to view a facsimile of the Mission Dolores marriage register. Used with permission. 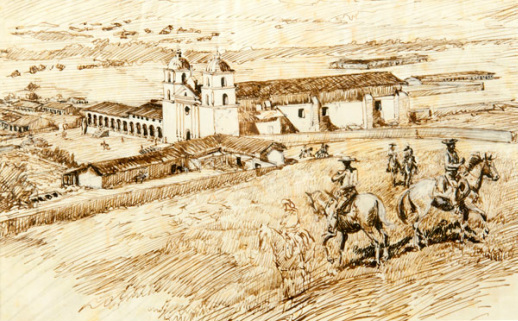 Courtesy of the Santa Barbara Mission Archive Library. 1. Bancroft, Pioneer Register, page 10; Bancroft, History of California, page 296, note 27. 2. Listed on 1733 Loreto Payroll. AGNM, Californias 80, exp. 53, ff. 442-443. 3. Listed on 1733 Loreto Payroll. AGNM, Californias 80, exp. 3, ff. 19-24. 4. Information given in 1790 re-enlistment at Santa Barbara. 5. AGNM Prov. Int. 7 exp.11. 7. AGNM Indiferente. D. Guerra, legajo 3, tomo 161D. 8. Bautismos hechos desda mediados del ano 1771 hasta mediados de 1773 por los PP. Nuevos Ministros Fr. Franco. Dumetz y Fr. Luis Jaume [Letter 3 April 1773 to Fr. Serra]. 9. Bill Mason’s 1790 Census Book. 10. Bancroft, History of California, vol. 1, p. 296, note 27. Witnesses: Jose Raymundo Carrillo, Jose Bonifacio de Estrada, Juan Maria de Olivera, Jose Ignacio de la Higuera. (First marriage listed in the Libro de Casamientos of San Francisco). 11. Report of Jose Moraga, San Francisco, October 4, 1781. 12. Archives of California, LIV, Provincial State Papers, Sacramento, 24-25. 13. Benecia Military Records, vol. 18, page 90 (Eldredge copy). 14. Padron of Santa Barbara, 1790, Eldredge papers, The Bancroft Library, p. 92. 15. Santa Barbara Burials, Northrup, II p. 52.